100% Polyester Woven. 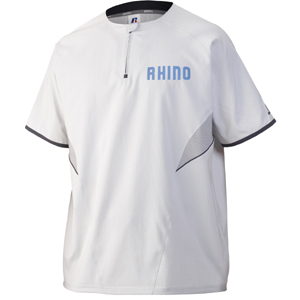 Very lightweight breathable fabric with moisture wicking capability. Full cut body with quarter zip neck to go over uniform. Waist has shock cord with cord lock on wearer's left. 4 side sew label lower left front. "R RUSSELL" left sleeve end. Shown with optional decoration not included. Coordinating adult style 872RVMK. Available April 2019.